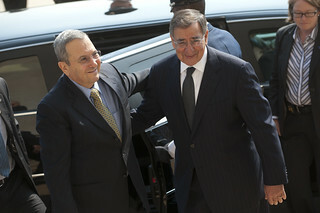 In a joint appearance today before the House Budget Committee, Defense Secretary Leon Panetta and Joint Chiefs of Staff Chairman Gen. Martin Dempsey testified regarding the proposed FY2013 budget-and they set the record straight when it comes to helping provide needed funds for America’s closest ally in the Middle East, Israel. With regards to Israel, we have significantly increased the amount of funds that we provide to Israel. It’s now $650 million, which more than doubles what was the level in the prior administration of about $320 million. We have provided significant funding for Israel’s Arrow and Sling ballistic missile defense programs; we’ve secured funding for Iron Dome system, which is a great defense system for them, against short range rockets; and whatever decisions we have made with regards to Israel and her assistance level, has been made in conjunction with them. There’s no group in America more determined to prevent Iran from achieving a nuclear weapon than the Joint Chiefs of Staff. I assure you of that. Our support to Israel is unshakable, and we’ve reflected that frankly in our budget request. The budget request by the way is done in collaboration very closely with the Israeli government. Since taking office, the Administration has requested money for a number of missile systems that they have, the Arrow and David’s Sling ballistic missile defense programs, as well as the Iron Dome system which is a very effective system for defense against short range rocket attacks. The total amount of assistance that we provide Israel is $650 million, which is more than double what was provided in the last administration, which was at a level of I think about $320 million. So we are making a significant contribution to Israeli defense. The Administration, the President has made clear that we will prevent Iran from getting a nuclear weapon. Period. This isn’t about containment, this is about preventing them from gaining a nuclear weapon and nobody should make a mistake about our intent here. What we have done is to work with the international community to make clear to Iran that they have to deter from the effort that they are making to develop their nuclear capability; they have to stop what they are doing in terms of promoting violence abroad, providing assistance to terrorists abroad; they have to stop any kind of effort that would close the Straits of Hormuz. We have made very clear what those red lines are-the international community has joined together in a series of very tough sanctions, diplomatic sanctions, economic sanctions, and I can tell you that those sanctions are biting. They’re isolating Iran, they’re impacting on their economy, they’re impacting on their ability to govern their own country. The whole point of those sanctions is to put pressure on them to make clear that they have to join the international community, live up to their international responsibilities; but if they don’t, we have put every option on the table to make clear to them that there is nothing that we will hesitate to do to stop them from developing those kinds of weapons. These are the most sanctions we have ever applied against one country. The sanctions we’ve just applied impact on their energy, impact on their banking system, and those will continue to take effect. The combination of what we have done I think has sent a very clear signal that the behavior that they are engaged in is not to be tolerated.